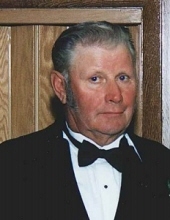 Marvin Herman Schumacher, 89, of Eau Claire passed away on Monday June 11th 2018 at Augusta Health and Rehabilitation in Augusta, WI. Marv was born in Eau Claire Wisconsin on October 4th, of 1928 to Fred and Anna Schumacher. He attended Pleasant Valley School in Eau Claire until 8th grade and then attended high school in Fall Creek, WI. He was married on October 4th, 1975 at St. James Trinity Lutheran Church to Shirley Benson. Marv was a self-employed farmer his entire life. He was on the Board for the Augusta Farmers Union, and the Equity Livestock Association. He was a member of St. James Trinity Lutheran Church in Fall Creek. Marv also loved participating in Tug-o-war and going for rides in the country during his free time. Marv is survived by his wife Shirley, son Douglas (Sheri) Sorensen along with their children Cailey, Nathan, and Emallie; his daughter Cindy (Curtis) Kolpien and their children Maechaela and Mackensy, and his son Charles (Brittany) Schumacher. He is also survived by his sister Ruth (Ted) Gilbertson and sister in law Jean Schumacher. He is survived by many other family and friends. Marv is preceded in death by his parents Fred and Anna Schumacher and his three brothers Charles, Leonard, and Larry. The family would like to extend a special thank you to the staff of the Fall Creek Valley Care Center, Augusta Health and Rehabilitation, and all others who cared for and supported Marv. Funeral services will be held on June 15th at 11 am at St. James Trinity Lutheran Church at 305 State St, in Fall Creek and will be officiated by Pastor Rick Biedermann. Burial will follow at Trinity Cemetery in Fall Creek, followed by a luncheon at the church. Visitation will be held at Stokes Prock & Mundt Funeral Chapel, 535 S. Hillcrest Pkwy, Altoona on June 14th from 4-8 pm. In lieu of flowers, memorials may be given to St. James Trinity Lutheran or the charity of your choice. "Email Address" would like to share the life celebration of Marvin Herman Schumacher. Click on the "link" to go to share a favorite memory or leave a condolence message for the family.